The House passed the bill, 363-62, on Tuesday. It includes several provisions that will impact Washington state. The U.S. House of Representatives Tuesday passed a wide-ranging public lands bill with big implications for Washington state, including measures that would greenlight federal involvement in a multibillion-dollar Yakima water project, reauthorize a key conservation fund and prevent new mining in the Methow Valley. The omnibus bill, a patchwork of previously pitched bills from Republicans and Democrats, was stitched together in the Senate by Sen. Maria Cantwell, D-Wash., and Sen. Lisa Murkowski, R-Alaska, in consultation with House leaders. It passed in that chamber earlier this month. The House vote was a resounding affirmation of bipartisan support for the legislation. The bill includes measures sought by lawmakers from most every state, including a smattering of pet projects, and might also be an indication that to reach broad consensus in Washington, D.C., the sausage-making requires a serving or two of locally sourced pork. Representatives from both sides of the aisle Tuesday took turns celebrating local portions of the bill on the house floor. Washington’s Kim Schrier, D-Issaquah, and Dan Newhouse, R-Sunnyside, both encouraged colleagues to approve the legislation and each lauded the Yakima water project as “a model” on water-scarcity issues and compromise. The House passed the bill, 363-62, under suspension of its rules, which means it required a two-thirds vote of approval. Every member of the Washington delegation voted for it. The bill will soon head to President Donald Trump’s desk to be signed into law. Many outdoor and environmental groups across the country have praised the bill, which permanently reauthorizes the Land and Water Conservation Fund (LWCF), a program created in 1964 in legislation sponsored by legendary Washington Sen. Henry M. “Scoop” Jackson. The LWCF directs revenues from federal oil and gas royalties to federal, state and local park projects and land acquisitions. 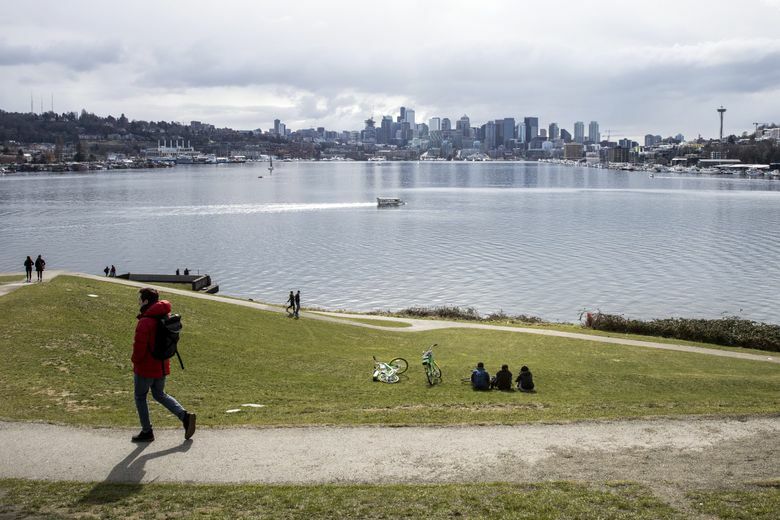 In Seattle, the program has funded expansion at Gas Works Park, land acquisition for Discovery Park and work at the Mount Baker Rowing and Sailing Center, among others. Recently, LWCF funding helped acquire private land along the Pacific Crest Trail, preventing the length of the trail from becoming severed. In recent years, the LWCF’s perch has been tenuous, as some politicians, like Utah Sen. Mike Lee, used the congressional reauthorization process to stump against federal land acquisition. If the LWCF is the headliner nationally, the Yakima River Basin Integrated Water Resource Management Plan portion of the bill might steal the stage in some parts of Washington state. The plan, coveted for nearly a decade by both Democrats like Cantwell and Republicans like Newhouse, of Sunnyside, would transform the watershed for both fish and farmers. A collection of irrigators, farmers, fish advocates, tribes and political officials has been working on the estimated $4 billion plan for about a decade. Washington state has invested millions into conservation projects already, as part of the 30-year-plan. Now, at least 10 years of federal financial support is all but ensured to follow. The project, which gives a wary eye to climate change’s effects here, aims to increase how much water can be stored in the Yakima basin to help fish and provide to farmers during drought years that scientists predict will increase in frequency. Newhouse said he was grateful to partner with Cantwell and Schrier in promoting the plan. Several other Washington projects in the works for years will also become law upon the president’s signature. The public lands bill would prevent new mining activities on federal land in the Methow Valley. Community members in the valley have been organizing against a Canadian mining company’s exploratory drilling proposal for several years. Cantwell and Washington Sen. Patty Murray, also a Democrat, have introduced several bills for “mineral withdrawal” in the Methow, but never found enough traction in Congress. The bill would also create a volcano early warning system, direct federal agencies to explore new wildfire-fighting technology like drones and GPS tracking, and facilitate the construction of target-shooting facilities on federal land. In addition, Seattle’s Nordic Museum would get a national designation, much of the Interstate 90 corridor would become a National Heritage Area called the Mountains to Sound Greenway, and many miles of Western Washington shoreline would become the Maritime Washington National Heritage Area. These designations could open up funding opportunities for organizations that promote them.